The Holy Family Finance Council is a consultative body of parishioners who advise the Pastor in matters pertaining to the financial affairs of the parish. Membership is by appointment from the Pastor. The Pastor is an ex-officio member and President of the Council. The Executive Officer is a lay person appointed by the Pastor to assist the Pastor in coordinating the work of the Council. Meetings are held monthly from September to June. 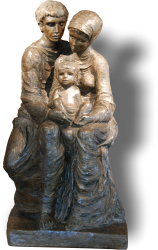 The Holy Family Pastoral Council is a consultative body of parishioners who assist and advise the Pastor in bringing to life the Parish Mission Statement through the investigation, reflection, and recommendation of issues brought to the attention of the Council by the Pastor. The Council is made up of elected, ex-officio, and appointed parishioners and staff. Meetings are held monthly September to June.